First things first for us is we need to make money off our property with rental income. We have a second house we are already renovating but since we are a farm that people come to visit for wellness retreats and earthworks workshops we need more spaces. There are many companies to buy yurts from but we chose pacific yurts.We like their design and they have been around for awhile. Normally the wait time is 12 weeks for a yurt but I found out that sometimes they can put some together with what they have in the shop but it wasn’t gaurenteed to be the shape or size that you were looking for. We happen to be double lucky in the fact that the ONE yurt they could put together was exactly what I wanted. Hmmm maybe bc I set that intention & focused! We got a 30′ yurt with 5 windows and a door. We were able to recieve it within 2 weeks. Ben got to business making the yurt platform. 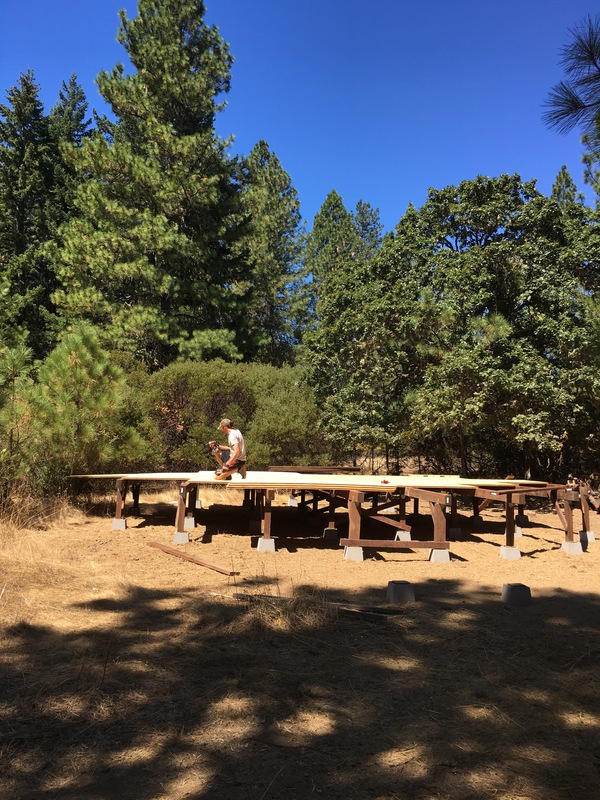 Pacific yurts gave exact directions on how to make the platform and then we put an additional layer of laminate click in flooring. The base for the yurt wasn’t cheap, keep that in mind when budgeting putting a yurt up!